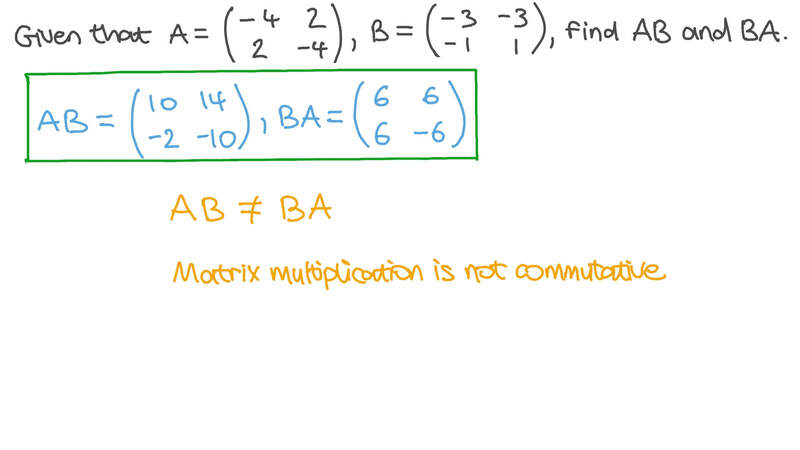 In this lesson, we will learn how to use the properties of matrix multiplication. Given that find 𝐴 𝐵 and 𝐵 𝐴 .
Matrices 𝐴 , 𝐵 , 𝐶 , and 𝐷 are square matrices. Use the associative law for three square matrices to determine which of the following proves that 𝐴 ( 𝐵 ( 𝐶 𝐷 ) ) = ( ( 𝐴 𝐵 ) 𝐶 ) 𝐷 . Consider the matrices Is ? Given the 1 × 1 matrices 𝐴 = [ 3 ] and 𝐵 = [ 4 ] , is 𝐴 𝐵 = 𝐵 𝐴 ? Given the matrices and , is ? Given that matrices and , is ? State whether the following statement is true or false: If 𝐴 and 𝐵 are both 2 × 2 matrices, then 𝐴 𝐵 is never the same as 𝐵 𝐴 . Is there a 2 × 2 matrix 𝐴 , other than the indentity matrix 𝐼 , where 𝐴 𝑋 = 𝑋 𝐴 for every 2 × 2 matrix 𝑋 ? Given three matrices 𝐴 , 𝐵 , and 𝐶 , which of the following is equivalent to 𝐴 ( 𝐵 + 𝐶 ) ? State whether the following statement is true or false: If 𝐴 is a 2 × 3 matrix and 𝐵 and 𝐶 are 3 × 2 matrices, then 𝐴 ( 𝐵 + 𝐶 ) = 𝐴 𝐶 + 𝐴 𝐵 . Express in terms of and . Given that is it true that ( 𝐴 𝐵 ) 𝐶 = 𝐴 ( 𝐵 𝐶 ) ? From the following, choose two matrices, and , such that , , and . Consider the matrices By setting equal to the zero matrix, find matrices and such that if , then for some numbers , and . Suppose 𝐴 𝐵 = 𝐴 𝐶 and 𝐴 is an invertible 𝑛 × 𝑛 matrix. Does it follow that 𝐵 = 𝐶 ? Given that 𝐴 =  − 1 4 − 1 1 1  and 𝐼 is the identity matrix of the same order as 𝐴 , find 𝐴 × 𝐼 and 𝐼 2 . From the following, choose two matrices, and , such that , with . If 𝐴 and 𝐵 are symmetric matrices, then the product 𝐴 𝐵 is also symmetric only when 𝐴 and 𝐵 are . What is the value of 𝐴 + ( − 𝐴 ) for any matrix 𝐴 ? If the matrices 𝐴 and 𝐵 both have order 𝑚 × 𝑛 , then what is the order of the matrix 𝐴 − 2 𝐵 ? Find a matrix such that for all matrices . Let 𝑍 be a 2 × 3 matrix whose entries are all zero. If 𝐴 is any 2 × 3 matrix and 𝐵 is any 2 × 2 matrix, which of following is equivalent to 𝐴 + 𝐵 𝑍 ? Given that is it true that 𝐴 ( 𝐵 + 𝐶 ) = 𝐴 𝐵 + 𝐴 𝐶 ?